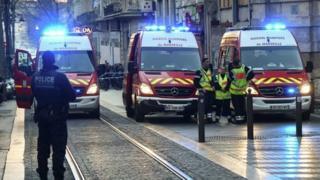 A man has been shot dead after wounding at least two pedestrians with a knife in the centre of Marseille. The attack occurred at about 16:45 local time (15:45 GMT) on Tuesday afternoon in the Canebière area of the city, which is France's second largest. Police said they opened fire after the man, who has not been named, threatened officers with a weapon. The prosecutor's office has said the attack was not politically motivated. "It's a common law assault," prosecutor Xavier Tarabeux said. At least one other pedestrian was reportedly injured during the confrontation with police.